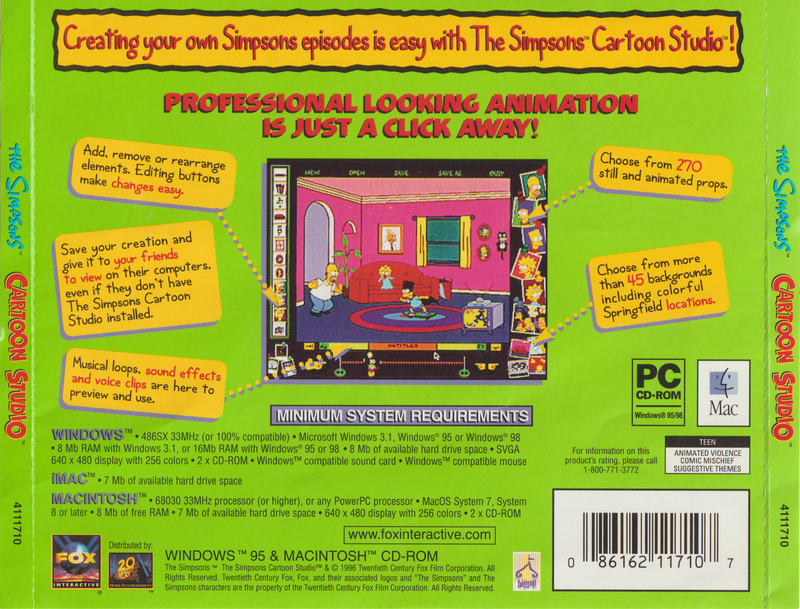 The Simpsons Cartoon Studio? "What the hell is this?! ", you may ask. 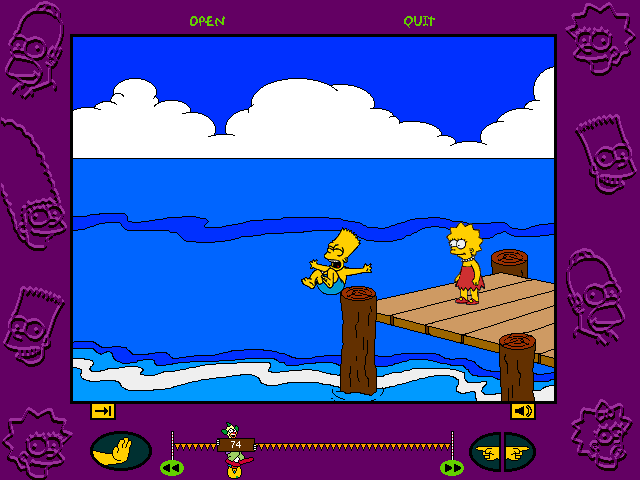 the long and mediocre Simpsons game franchise. 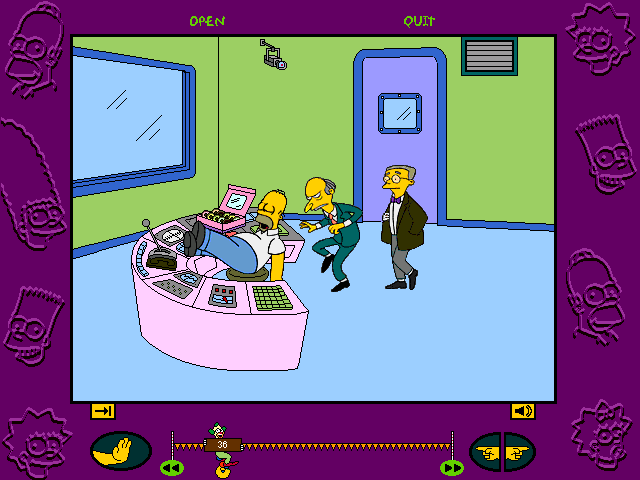 and sounds to create your own custom Simpsons cartoons. System: 68030 33 MHz processor or higher. System 7 or higher. 1. Insert the game CD into the CD drive. 3. Open the CD-ROM drive. 5. 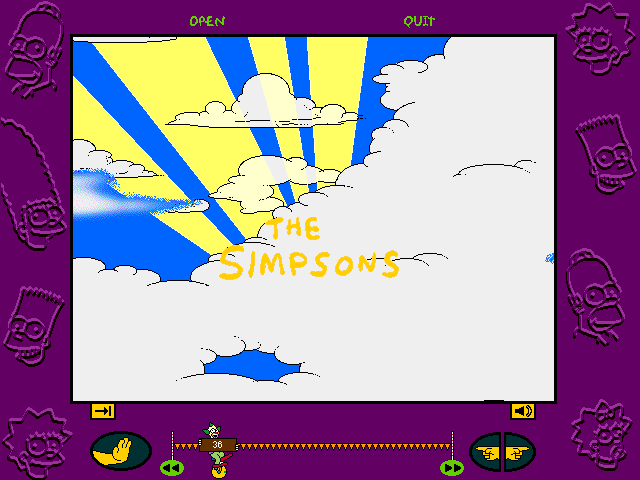 Open the Simpsons icon to play. 2. 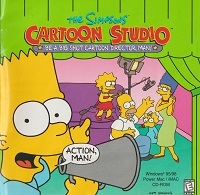 Open the Cartoon Studio CD icon. files will be installed onto the hard drive. 4. 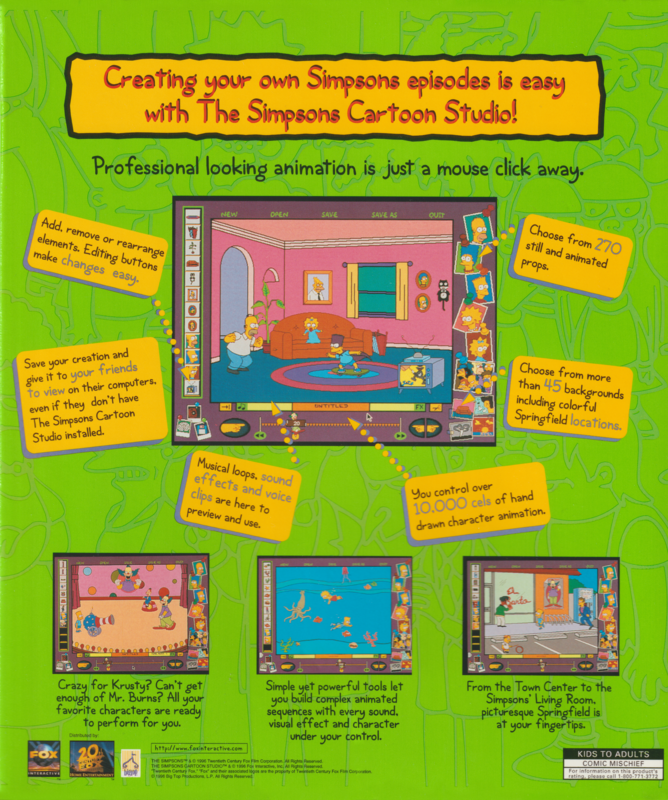 Open the Simpsons Cartoon Studio inside the Fox Interactive folder. nilly. First you must know what you are looking at. This is a simple (yet complex) explanation of the main menu. picture above and what each one means. bottom of the couch in the layer manager. Just add a few things to a cartoon and you'll see what I mean. NEW: Begin new cartoon. Keyboard shortcut 'N'. OPEN: Open saved or imported cartoon. Keyboard shortcut 'O'. SAVE: Save current cartoon. Keyboard shortcut 'S'. SAVE AS: Save as different cartoon. QUIT: Exit the current cartoon. You can also view the game credits. HOM: Access to all Homer animations. 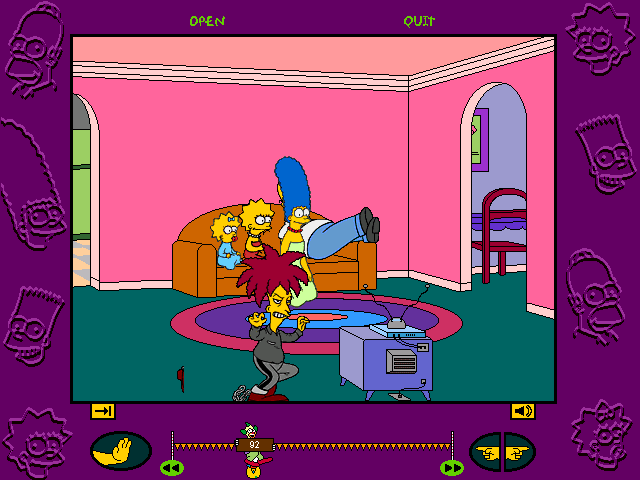 MAR: Access to all Marge animations. BAR: Access to all Bart animations. LIS: Access to all Lisa animations. MAG: Access to all Maggie animations. 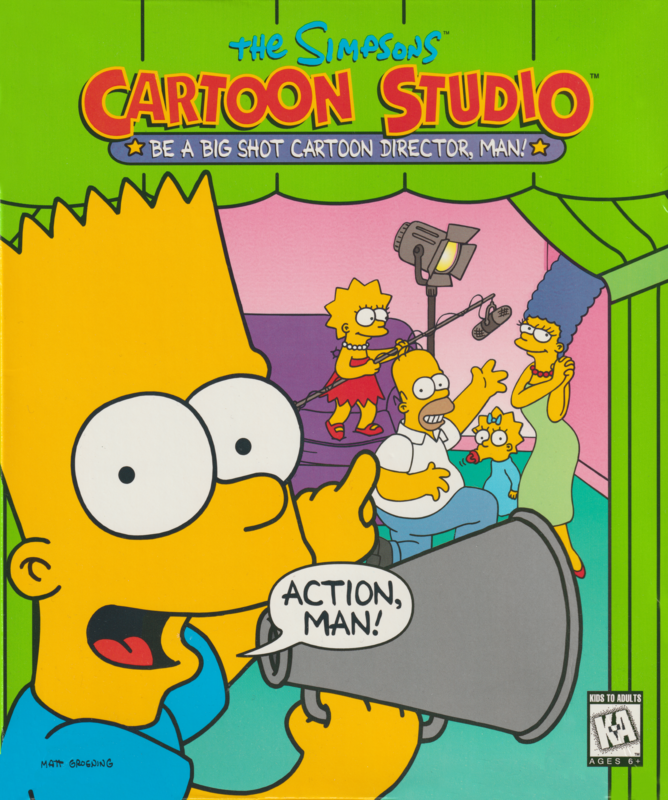 CIT: Access to all Springfield citizen animations. VC: Volume control. Increase or decrease the volume. computer is low on RAM. cartoons continuously. Keyboard shortcut 'L'. ST: Soundtrack. Displays the title of the current soundtrack. CT: Cartoon title. Displays the name of the current cartoon. CSE: Current sound effect. Displays sound effect titles. PR: Prop button. Get access to the props. SO: Sound button. Get access to the sounds. SE: Special effect button. Get access to the special effects. BG: Background button. Get access to the backgrounds. HAND>: Play cartoons. Keyboard shortcut 'P'. FF: First frame. This will rewind the cartoon to the first frame. different frames in the cartoon. LF: Last frame. Goes to the last frame in the cartoon. FFR: Frame by frame rewind. Go through frames one at a time. FFF: Frame by frame forward. Go through frames one at a time. Anyway, the character palette is fairly simple to understand. Here is a general overview of the backgrounds palette. --->: This is the other hand. Use it to scroll through each category. CB: Click the colored box to go to the colored backgrounds category. will appear in this rectangle. what is located in it. FUR: The furniture props. Chairs, sofas, etc. APP: The appliance props. Toasters, blenders, etc. FOO: The food props. Pies, pizza, etc. PLA: The plant props. Plants, plants, and more plants. ANI: The animal props. Dogs, cats, etc. DEV: The device props. Cameras, levers, etc. MIS: Miscellaneous props. Dolls, fountains, and weird stuff. things that can enhance a cartoon from mediocre to god-like. For your cartoon advancement, the special effects palette. <---: Use this hand to scroll through each category. near the bottom of the layer manager. switch one scene to the next? Here they are. BGE: Background special effects. These are good for freaky backgrounds. Anyway, here is the sound palette. to an eerie haunted number. find the voice clip here. ANM: If you need to add an animal sound, look for it here. for a little preview of that particular sound. ear) to listen to the sound, and if it's the right one click it. Now, when your ol' man says "Turn that down ya lazy punk! ", you can. here is the palette explanation. level volume, 3 being the highest, 0 being no sound at all. have to edit that sucker. the first frame to the current one. props and other non-moving objects. frame after the current one. the screen to access the save options. other stuff to make sure you get credit for your hard work. 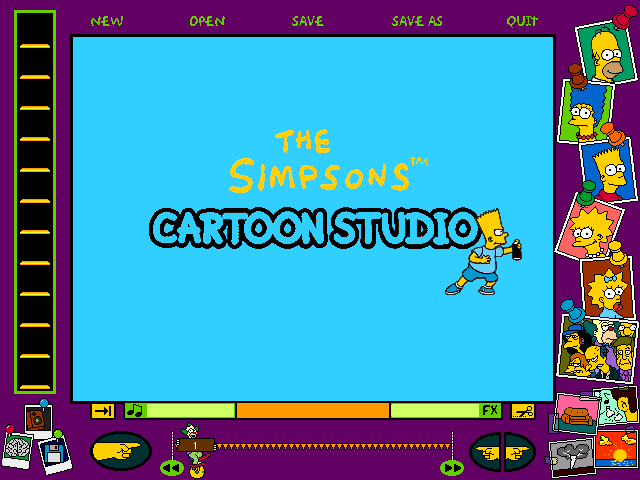 SCROLL: This scroll bar is used to select the various saved cartoons. NAME: Edit the name of your cartoon in here. SAVE: Once you've done everything else, click and save. game? How are they supposed to see your great Simpsons cartoons? exported cartoons. Check the Cartoon Player section for details. the disk icon in the lower left corner. SIZE: Here you can see the size of the file after it has been exported. QUICK: Double click here to export the cartoon for Cartoon Player. DESCRIP: Add a little description here. NAME: Name your cartoon whatever you like. CANCEL: Cancel the export and return to Cartoon Studio. if you intend to send it someone who also has Cartoon Studio. them Cartoon Player and the exported cartoon. to open a saved or exported cartoon in Cartoon Studio. QUICK: Click here to quickly open up a saved cartoon. DESCRIP: View the cartoon's description, or whatever is in there. NAME: View the cartoon's name. DELETE: If you select a cartoon, you can go ahead and delete it. extensions are exported cartoons, so you can import them. creating a cartoon. I'll be using a cartoon I made for the tutorial. Click on the NEW button at the top to begin. palette and look for the stage of the Krusty the Clown show. Next, move it down and position it so the bottom part is not visible. manager. Click the lights layer and cut it out. Your background is now set. a background prop. Click it and edit it so it remains in all frames. and edit it so it stays in all frames. the pole covered. Edit and add to all frames. cover the Krusty logo. Edit it for all frames. There, now this looks like a television stage. sure your cartoon is at frame 1.
a good idea to practice editing frame-by-frame. the sounds palette (the ear) in the lower right corner. that ear to preview it, then click to add it to the cartoon. fuzzy screen is now accompanied by a static noise. Go through the frames until you get to the first frame of the show. cut it from all later frames (the lower right editing feature). That'll do it for the background sounds. show, not the fuzzy effect. frame of the Sideshow Mel animation and click on him. Edit his animation so that he stands still in the standing position. corner to keep that pose in all the later frames. techniques. None are difficult, and the results are pretty cool. the right side, so get to the animations of him facing left. to use is the one of him walking and facing the audience, smiling. out and try again. A lot of this is trial and error. for it up on that red platform, so let's animate a pie in the face! the food section (box of donuts). Click on the pie. but then it will go through an animation and get stuck in mid air. You have to go back and cut out every pie frame after the first one. reach the air. Move it one frame at a time, just like with the feet. go back and do it again. Like I said, trial and error. foreground special effects category (the frog). frames after), and position the splatter over Sideshow Mel's face. right over the old one. he remains in that pose (the top right editing feature). There ya go! A classic pie in the face gag. When the stage lights hit Krusty, it's time to switch animation. to the one where he is lying on the floor. All right, it's time for another special effect! corner), and look for a red and blue explosion animation. Krusty's head. It's just a cool effect to show the impact. Look for the Krusty voices, and preview the sound called Hey, Kids!. Click it once and it will play just as Krusty bows to the audience. pie is in the air, about halfway between Krusty and Sideshow Mel. gets back on his feet, then go to the voices palette again. feet, and he will say "Who do you love?". explosion and it will mix with the explosion to finish the effect. and look for Krusty's Groan 2 sound, and add it right after. Press Play to test everything, and that'll do it. 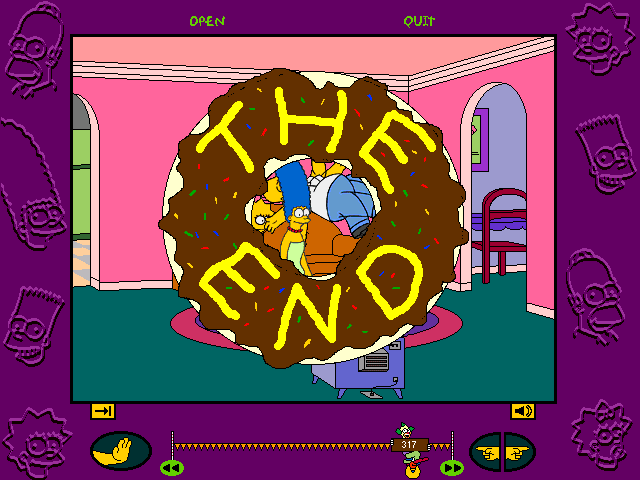 third ending, with the yellow squares and purple text. Applause 2. This will add some applause as the ending animation plays. any extra frames from the end. more to animate. Try coming up with your stories and animating them. THANKS FOR PLAY... er... ANIMATING! 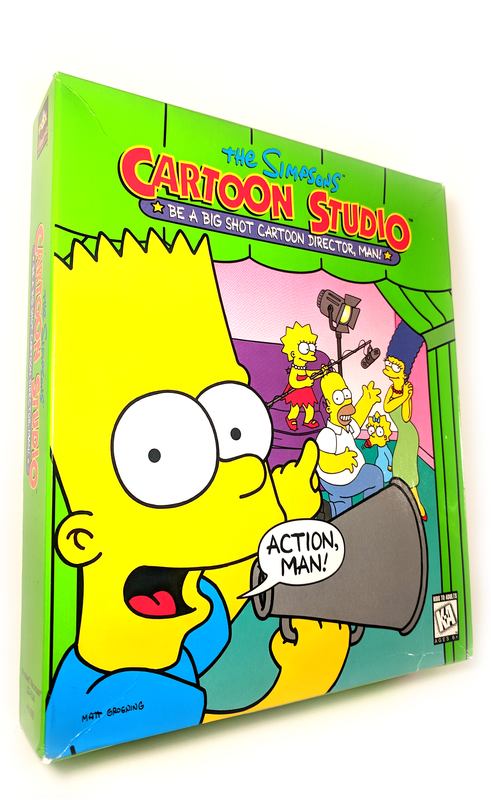 online and acquire themselves a copy of Cartoon Studio. Here is a quick overview of the Cartoon Player screen. one folder where you can easily open them. L: Play the cartoon continuously. HAND>: This is the Play button, for playing the cartoon. FF: Back to the first frame. LF: Forward to the last frame. FFR|FFL: Go through each frame one at a time. Q: What the hell is Cartoon Studio? A: Try reading everything above this line. Q: Well, where can I find it? A: eBay is your friend. Half.com will also work. Q: Where can I see some cartoons? 4. 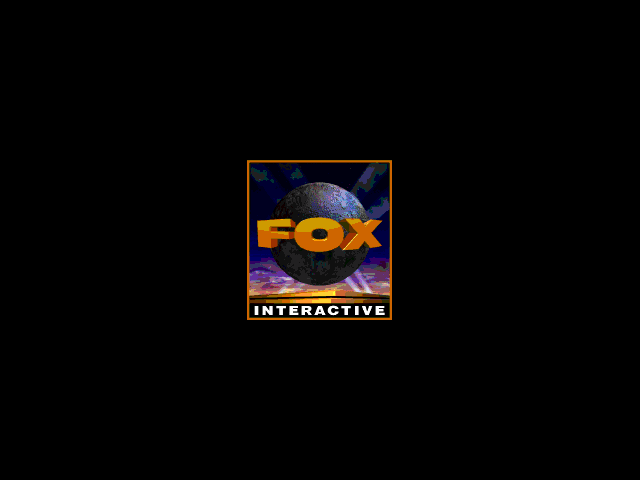 Fox Interactive and Big Top Productions for creating the game. property of the Twentieth Century Fox Film Corporation.